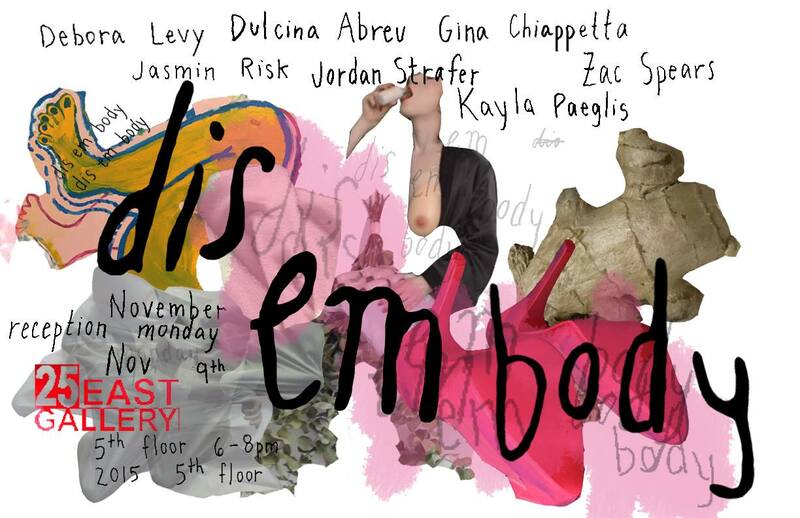 Debora Levy, Dulcina Abreu, Gina Chiappetta, Jasmin Risk, Jordan Strafer, Kayla Paeglis, and Zac Spears have problematized the fixed self, challenged corporeality, and crafted bodies without organs for dis em body at 25 East Gallery. It is impossible to be on time or even fashionably late when time is nonlinear and your presence is ephemeral. Rhizome-like, time sprouts in all directions with no clear beginning or end. You leave a textual trace of # in your wake. Hyper-aware of your body –you know they’ll photograph you– you’re living Donna Haraway’s reality in which “[t]he imagined “we” are the embodied others, who are not allowed not to have a body.” A third embodiment is the sum of two of your selves. You’re a mother feeding yourself your own milk. Nourishing your affect so your mascara melts. Fabric becomes your surrogate body, projected again on another cloth. A tv screen is unsure whether to glitch to a fixed image or to move in dissonance. It’s a big lumpy cushion we sit on. We’re an un-wholly body, invisible in your presence. We, with appendages we’ve gathered and fashioned. We, sub/ob/ab-ject, our edges blur and spill. Our unavoidable “bodies”, marked as other, are not allowed to be forgotten.